A super soft, chewy, and thick chocolate chip cookie cake, decorated festively for Easter! 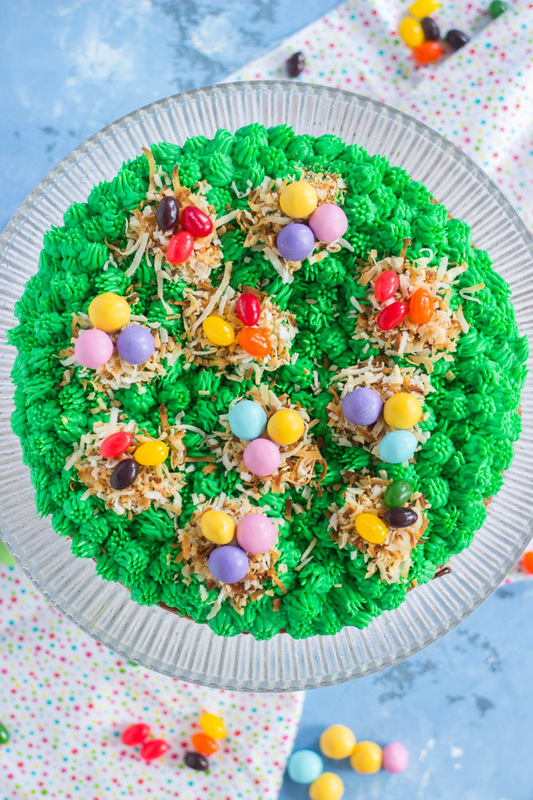 This Bird’s Nest Chocolate Chip Cookie Cake is incredibly simple, ultra-delicious, and a total crowd-pleaser! I can’t believe it, but it already feels like 2018 is getting away from me! Sure, it’s only mid-February, but also, it’s already mid-February! It happened so fast. 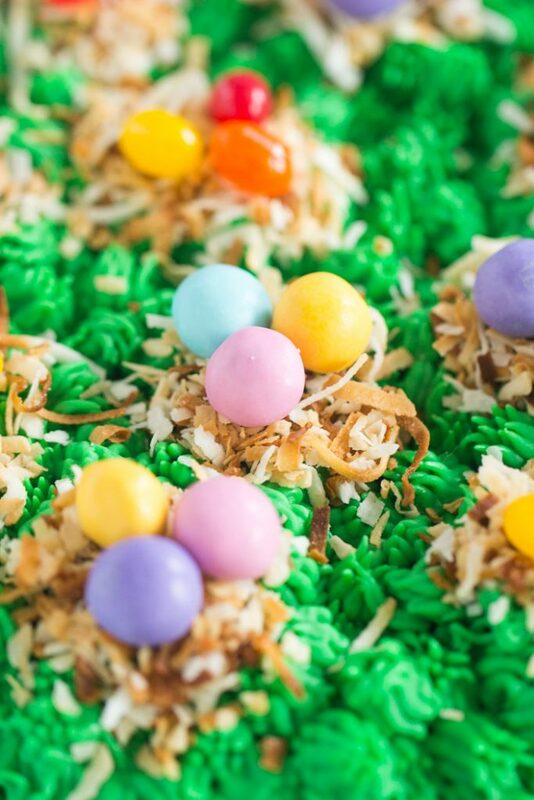 In the food blogging world, I’m behind on posting recipes for St. Patrick’s Day at this point, and I should already be sharing recipes for Easter. People are so on the ball!! At this rate, it’s only a few short months before I’ll be posting all things pumpkin!!! Crazy. 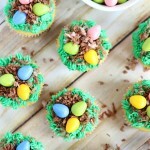 One thing I knew for sure that I wanted to do this year – a super cute Easter-themed dessert, inspired by these Bird’s Nest Cupcakes from a few years ago. Those cupcakes are such a classic, and so easy to decorate. People love how festive they are! I was equally determined to share a Chocolate Chip Cookie Cake recipe this calendar year too, so I’m bringing together both those ideas. 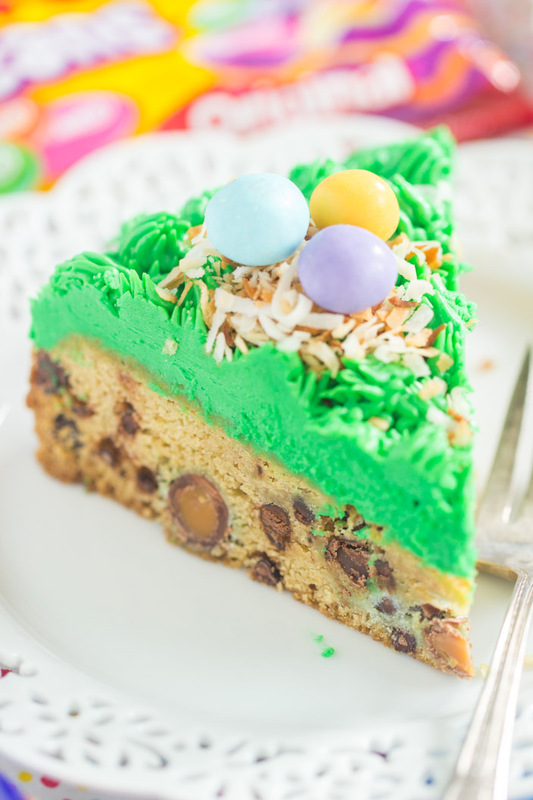 We’ve got an adorable and simple Easter dessert, this Bird’s Nest Chocolate Chip Cookie Cake. This recipe is a breeze to make. If you’re comfortable making chocolate chip cookies, this is even easier! The decorating is also extremely simple. Whatever your skill level in the kitchen, you can definitely make this Bird’s Nest Chocolate Chip Cookie Cake successfully. 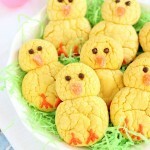 It will be such a hit with kids and adults alike on Easter Day. 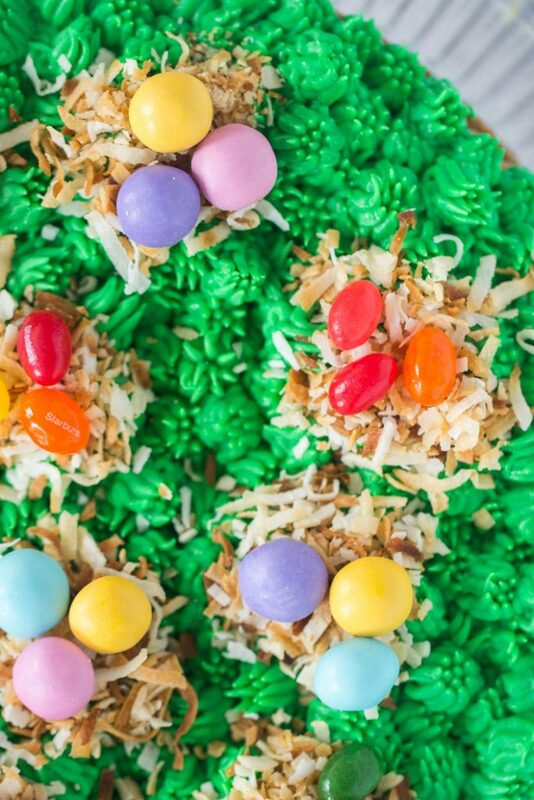 I used the M&M’S® Caramel candies right in the chocolate chip cookie batter for a boost of gooey caramel goodness in the cookie, and they also served as some of the ‘eggs’ on top of the coconut nests for decorating this cookie. 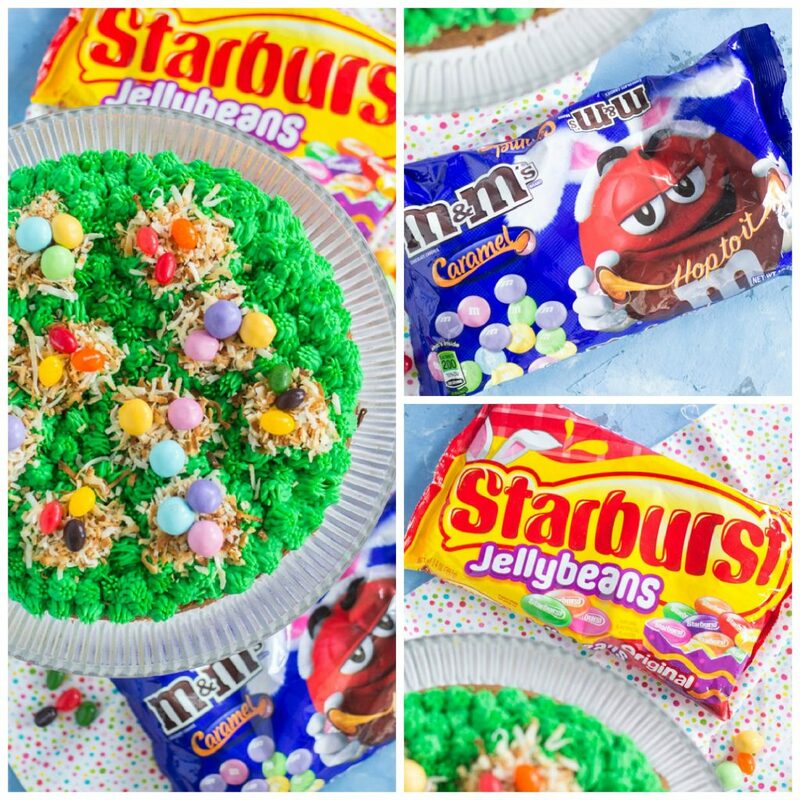 The STARBURST® jellybeans also served as bright, beautiful, delicious ‘eggs’ on top. 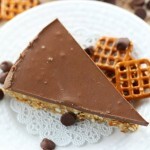 You will love this perfect Chocolate Chip Cookie Cake recipe. It’s far easier than making chocolate chip cookies by the traditional drop method, and it’s supremely soft, chewy, and THICK. It’s almost an inch thick, yet stays very, very soft! Not a hard, crunchy cookie. 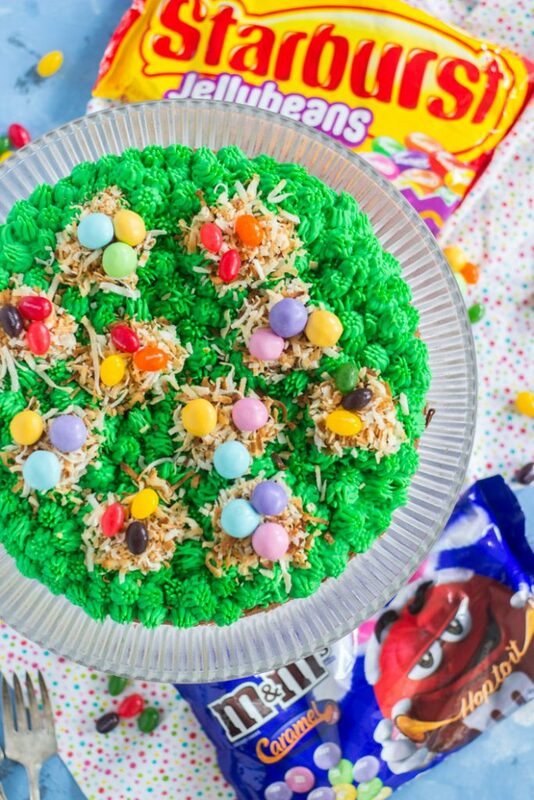 And it’s chock-full of chocolate chips and M&M’S® Caramel candies that stay melty and gooey. I used homemade cream cheese frosting because it will always be my #1 frosting choice, but a simple vanilla buttercream is perfect too, or you could even grab a can or two of prepared frosting – that totally works as well! But really, is there anything better than a giant chocolate chip cookie topped with frosting? This simple classic will always be a hit! 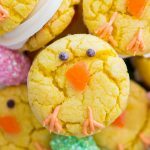 For other awesome Easter recipes, you must take a peek at these ultra-cute Easter Chicks Lemon Cookies and Easter Chick Cookies! 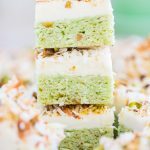 And some of my personal favorite spring recipes include this Coconut Pistachio Bundt Cake, this Lemon Blueberry Bundt Cake with Lemon Glaze, and these Pistachio Sugar Cookie Bars! 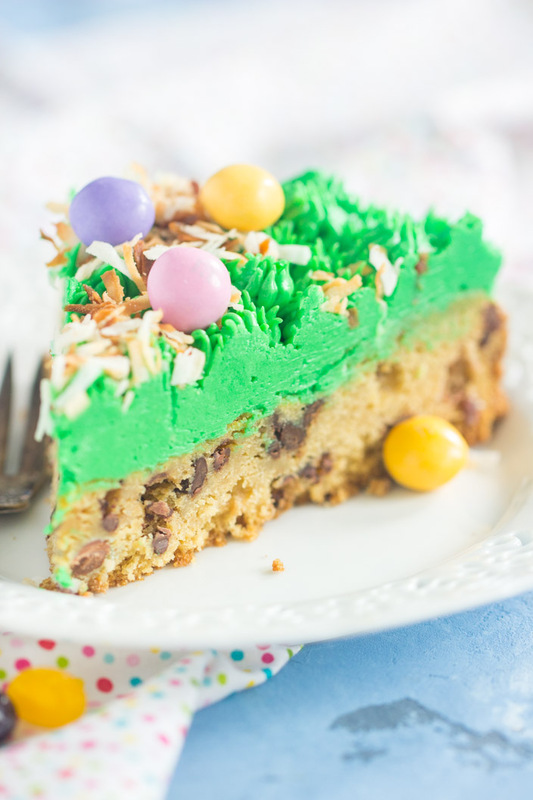 A super soft, chewy, and thick chocolate chip cookie cake, decorated festively for Easter! 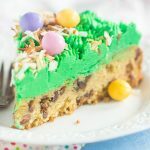 This Bird's Nest Chocolate Chip Cookie Cake is incredibly simple, ultra-delicious, and a total crowd-pleaser! In a large mixing bowl, beat butter and brown sugar until creamy. Add egg, egg yolk, and vanilla extract, beating until combined. In a medium bowl, whisk together flour, cornstarch, baking soda, and salt. Fold in semi-sweet chocolate chips, mini chips, and M&M'S® Caramel. Spray an 8-inch springform pan with non-stick spray. Spread batter evenly into the bottom of the springform. Bake at 350 degrees for 30 minutes, or until the edges and top are golden, and a toothpick inserted near the center comes out clean. Once cool, run a knife around the edge to loosen the cookie. Release the springform pan, and transfer the cookie to a serving plate. In a large mixing bowl, beat butter and cream cheese til creamy. Add 4 cups powdered sugar, and beat until combined. Frosting should be thick and fluffy, but pipeable. Add additional powdered sugar, if needed, 1/4 cup at a time! Add green food coloring, and beat until blended. Fit a parchment or decorating bag with a #233 tip, or similar tip for creating a grass effect. Fill bag 2/3-full with frosting. Holding the bag 90 degrees straight up, squeeze frosting onto cookie, until about 1/2-inch thick, pull straight up and discontinue squeezing, creating a grass effect. 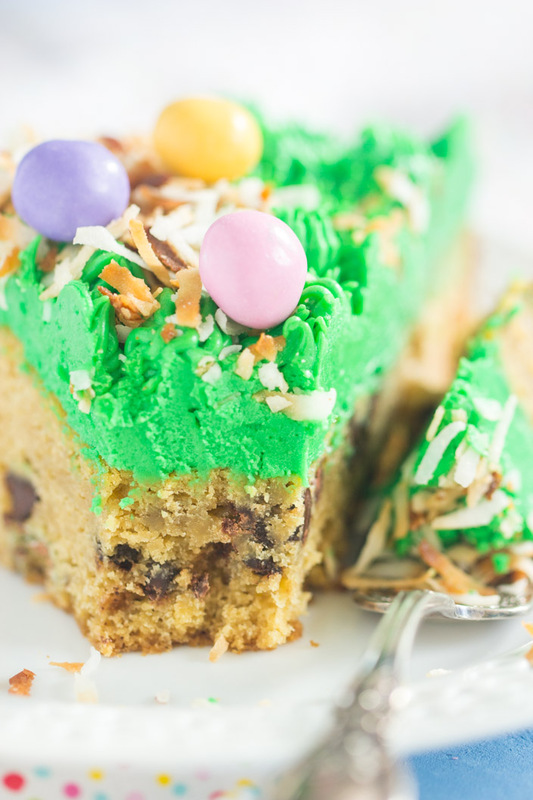 Cover the entire surface of the cookie cake with frosting. Chill in the refrigerator for 20-30 minutes, or until frosting is set. Fill each nest with 3-4 'eggs' using the M&M'S® Caramel and STARBURST® Original Jellybeans!